Tapsilog is a popular breakfast dish consisting of Filipino beef tapa, fried egg, and garlic fried rice. Tapsilog is a condensation of the words “tapa, sinangag at itlog” (tap-si-log) which translates to beef tapa, garlic fried rice, and egg. This dish often enjoyed with a generous portion of sinangag (garlic fried rice). It is also served alongside fresh tomatoes, cucumber slices, and a spicy vinegar dipping sauce. Collectively, tapislog is a harmonious combination of sweet, sour, salty, and umami. Traditionally, tapa was a means to extend the shelf life of meats (and other proteins like chicken and fish). The meat was cured or dried with salt and various spices similar to beef jerky. Nowadays, beef tapa is simply marinated and cooked (either grilled, sautéed, or fried). The marinate mixture consists of: soy sauce for saltiness, calamansi juice for a punch of sour, sugar for sweetness, and garlic for warmth. This dish all about balance. The contrasting flavors and textures work together to keep your palate wanting more. 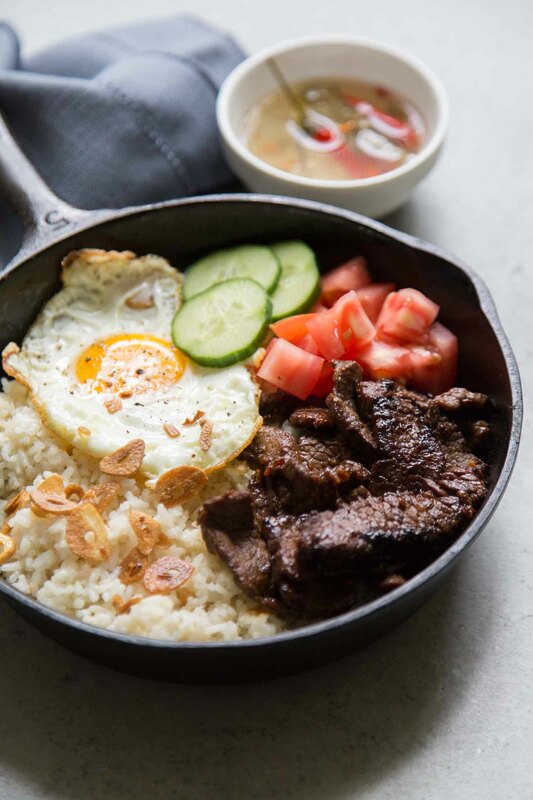 The richness of the beef, fried egg, and garlic rice is leveled with fresh tomatoes and crisp cucumbers. A sprinkling of fried garlic chips adds crunch and a punch of umami. To round everything out, a spicy vinegar dipping sauce (made by soaking fresh Thai chili in white vinegar), cuts through all the fat and savoriness. While tapislog is most popular for breakfast, it can really be enjoyed for any meal. Even the occasional midnight snack after a night of drinking! 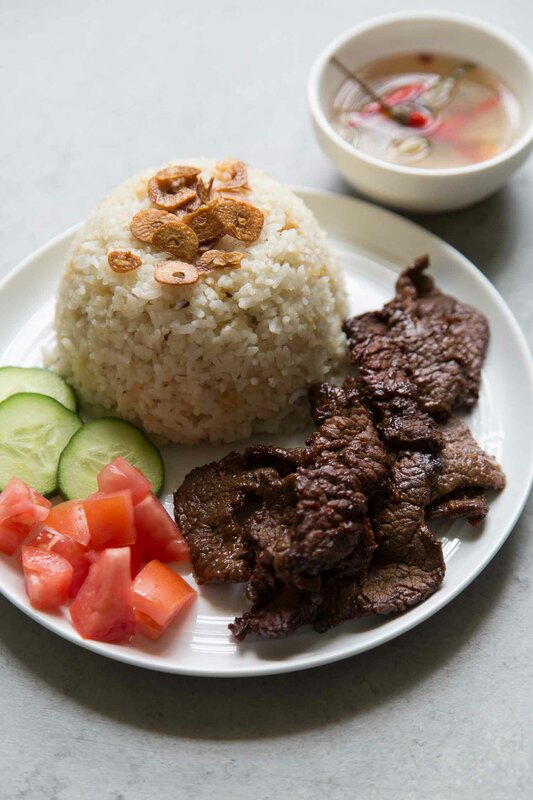 Tapsilog is a popular Filipino breakfast dish that consists of beef tapa, fried egg, and garlic fried rice. Serve it alongside fresh tomatoes, cucumber slices, and a spicy vinegar dipping sauce. Mix together soy sauce, calamansi juice, brown sugar, minced garlic, and black pepper until sugar has dissolved. Toss in sliced beef. Cover and let marinate in the fridge for at least 4 hours (up to 24 hours). 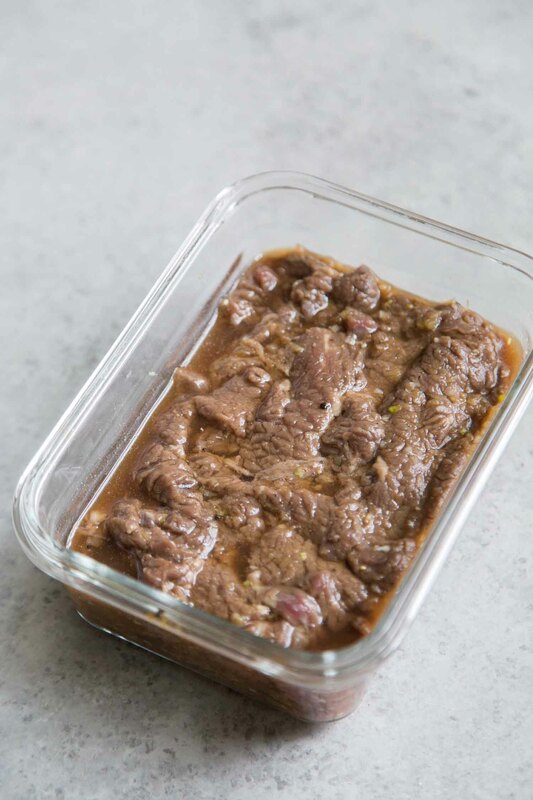 Strain beef from marinade. Add about one tablespoon of cooking oil (grapeseed oil or vegetable oil) in a large skillet over medium heat. Once oil is hot, cook in beef in batches. Cook beef on each side for 2-4 minutes until well browned. Serve hot with garlic fried rice and fried egg. Spicy vinegar sauce is made by soaking Thai chili in white vinegar. All images and text ©The Little Epicurean. I love this dish. I will definitely make this for breakfast on Cinco De Mayo. Where can I buy calamansi juice? Many Asian markets (or specifically Filipino markets) sell fresh, frozen, or concentrated calamansi juice. Your photos made me crave for Tapsilog, Mary Ann! This is how I make my tapa too, but sometimes I use lemon when I don’t have calamansi on hand. Thanks! I always keep some calamansi juice in the freezer for cooking!